With a little over a third of the IPL season now complete, what are the major trends to have emerged? How have the teams fared? Which individuals have stood out? And what tactics have worked or backfired? Here is an in-depth look. The undisputed player of the season so far is Andre Russell. He has batted four times and every time he has been utterly brilliant. His scores so far are 49* (19), 48 (17), 62* (28) and 48* (13). Russell is the fourth highest run-scorer this season with 207 runs - and he has done so at a mind-warping strike rate of 268.83. Russell is not just playing a better game than the rest of the IPL; he is playing a radically different one. So far this season he has scored 190 runs from his 60 attacking shots - this is attacking batting like we have never seen before and it is recalibrating what is possible. 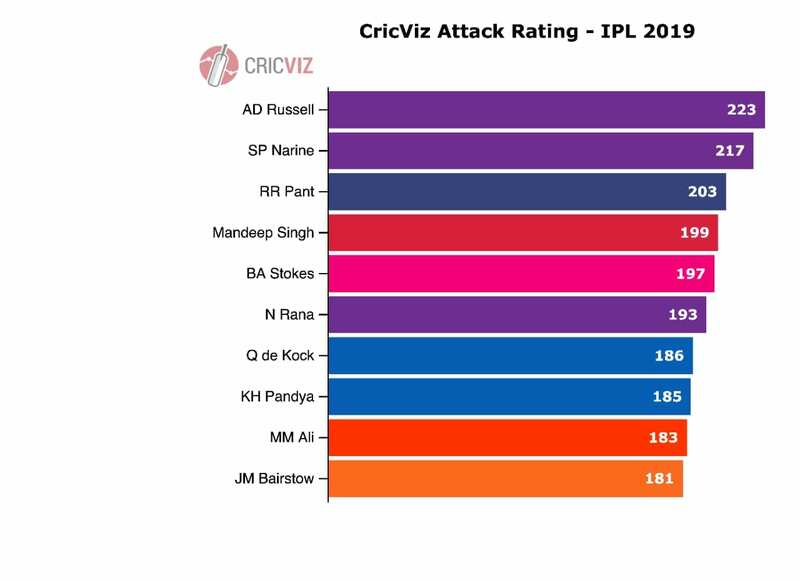 The only player in the league who comes close to Russell’s attack rating of 223 is his team-mated Sunil Narine. A new season brought a new opening partnership at SRH with David Warner paired with Jonny Bairstow. The partnership has been a huge success, bringing 517 runs off 306 balls with both player’s thunderous hitting complimented by their rapid running between the wickets - a particularly effective strategy at the Rajiv Gandhi Stadium where the large square boundaries offer plenty of room for turning singles into doubles. Across SRH’s first four matches they didn’t lose a single wicket in the Powerplay. However, the downside of Warner and Bairstow’s good form has been that SRH’s middle order has had very little time at the crease. The problem with this was laid bare in SRH’s defeat against MI on Saturday when they lost both openers early for the first time and SRH’s raw middle order was exposed, before imploding. So far this season Manish Pandey, Deepak Hooda and Yusuf Pathan have scored 130 runs between them in 13 innings at a strike rate of 97.66. 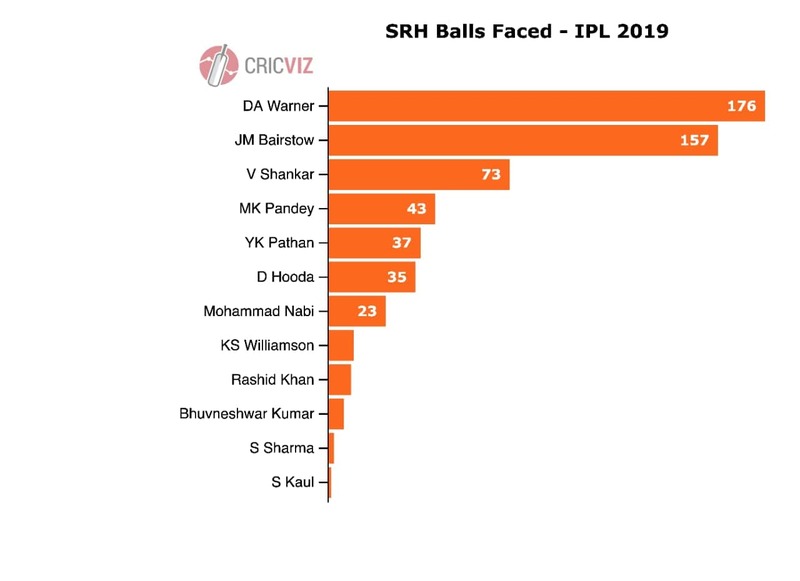 SRH’s middle order trouble may eventually force them to leave Mohammad Nabi out of the team - despite him having bowled superbly so far this season - to accommodate Kane Williamson and bolster the batting. Williamson played against RCB, meaning SRH selected three overseas batsmen for the first time in their history. This shift can be seen as the product of their weak Indian batting and strong Indian bowling as much as a pre-conceived strategy to become more batting-heavy. 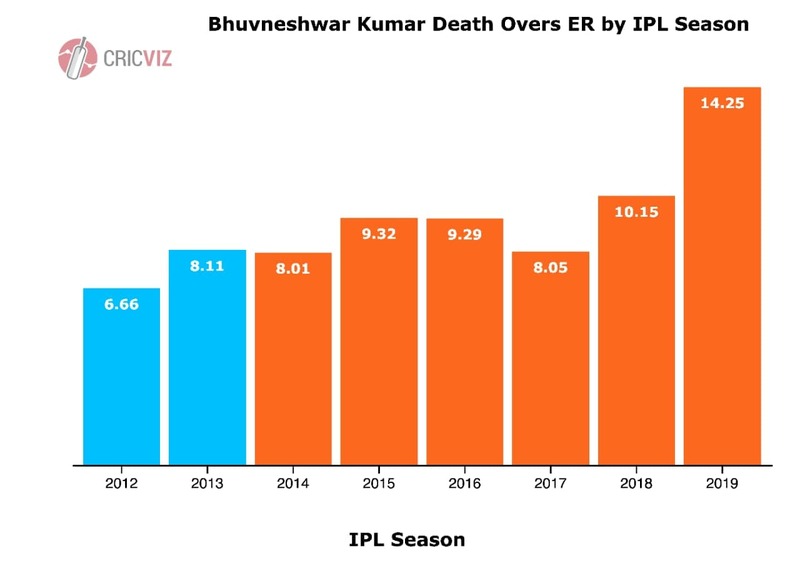 Bhuvneshwar Kumar was one of the most effective death bowlers in the IPL between 2012 and 2017 but since the start of last season he has really struggled in the phase, with his economy rate in the last five overs rising from 8.46 to 11.42. Central to Bhuvneshwar’s troubles appears to be a reluctance for him to attempt his yorker as often - with his yorker attempts falling from 50% to 30%. This drop off is not a product of him landing his yorker less often; in fact his successful yorker percentage has risen from 34% to 46%. But for some reason Bhuvneshwar has lost confidence in his best delivery and it’s costing him dearly. Sandeep Sharma has assumed a new role for SRH this season. Historically he has been something of a Powerplay specialist, delivering 62% of his overs in the first six. This season though he has only bowled 31% of his overs in the phase. As a result he has shifted his approach from focusing on swing and increased his slower ball percentage from 13% to 42%. 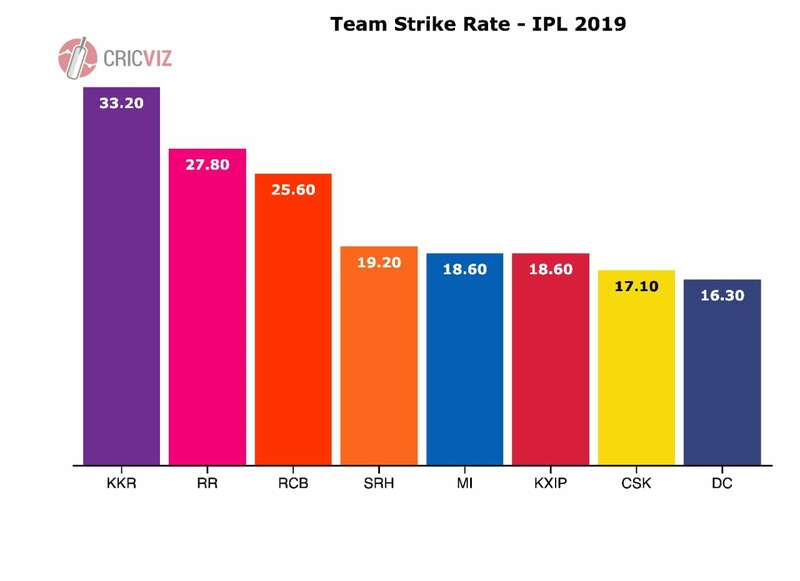 CSK’s strong start to the season has been founded on a clearly structured strategy with the ball that has seen Deepak Chahar bowl excellently in the Powerplay, maintaining an economy rate of just 6.15 before their strong spin attack has initiated the squeeze in the middle overs, then Dwayne Bravo assumed responsibility at the death. Teams need to look to disrupt this pattern if they are to have success against CSK. The strategy will now be tested by the absence of Bravo with Scott Kuggeleijn coming into the team. Harbhajan Singh is arguably one of the IPL’s most underrated players. He has been consistently excellent for a decade now and is showing no signs of abating. This year he has bowled brilliantly in the Powerplay where he has an economy rate of 6.00 and has taken four wickets in seven overs. His double-wicket maiden in CSK’s win against KXIP was a superb display of off spin bowling - beating Chris Gayle and Mayank Agarwal with flight, dip and turn. No CSK player to have played three matches season has a higher average impact than Harbhajan’s +9.8 runs per match. 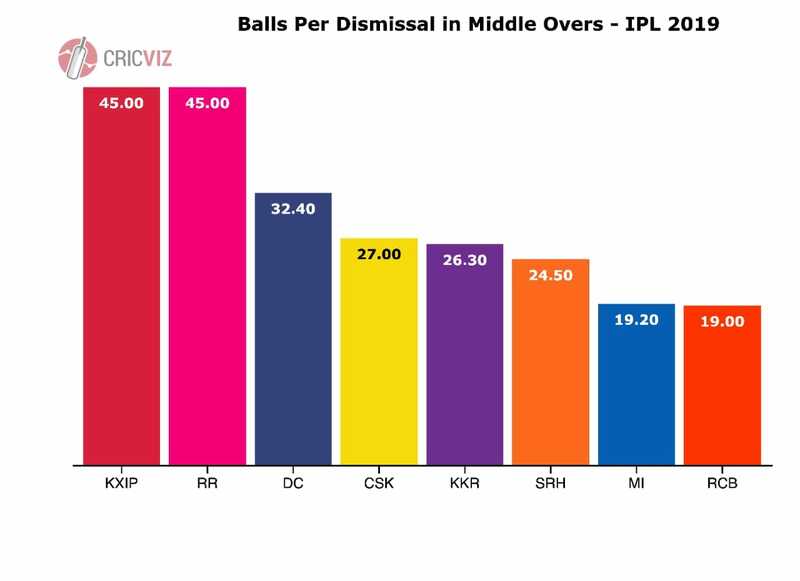 After generally being provided with strong starts by Quinton de Kock and Rohit Sharma in the Powerplay, MI have encountered problems in the middle overs where their balls per dismissal of 19.2 is second worst after RCB’s with the form of Yuvraj Singh and Krunal Pandya being the main causes for concern. Yuvraj has now been dropped which has allowed Ishan Kishan - a hugely surprising omission at the start of the season - to come into the team. Krunal’s patchy form is largely the product of his problems with the short ball, which appear to be worsening. Three of his five dismissals this season have come against short balls. His career average against them now is now just 16. After three low scores in his opening three innings Kieron Pollard was beginning to come under some pressure in MI’s middle order. 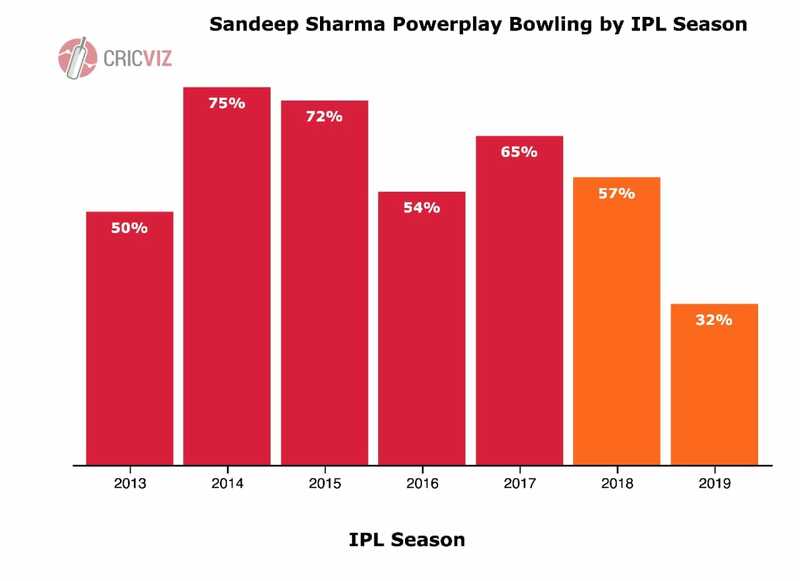 His problems were exaggerated by the fact that last season was arguably the worst IPL campaign of his career and resulted in him being dropped. However, IPL form alone is misleading. Since last year Pollard has had superb seasons in the CPL and PSL where he scored 615 runs at a strike rate of 165.32. Form is temporary and class is permanent and it was no surprise to see Pollard’s bludgeon a crucial 46 not out against SRH on Saturday. Although Alzarri Joseph’s sensational 6 for 12 was the headline performance from MI’s defence of 136 against SRH, arguably the more important bowling display came from the leg spinner Rahul Chahar whose 2 for 23 combined attack and defence expertly and helped squeeze SRH in the middle overs. Krunal is an excellent defensive spinner but MI do lack an attacking option in the middle overs. Last year that role was filled by Mayank Markande but so far this season Markande has been unable to secure a spot in the team and Chahar’s performance against SRH offers huge reason for encouragement for MI. Delhi’s season so far has been defined by their lower order batting collapses which cost them a near-certain win against KXIP and nearly cost them against KKR only for them to sneak home in a Super Over. 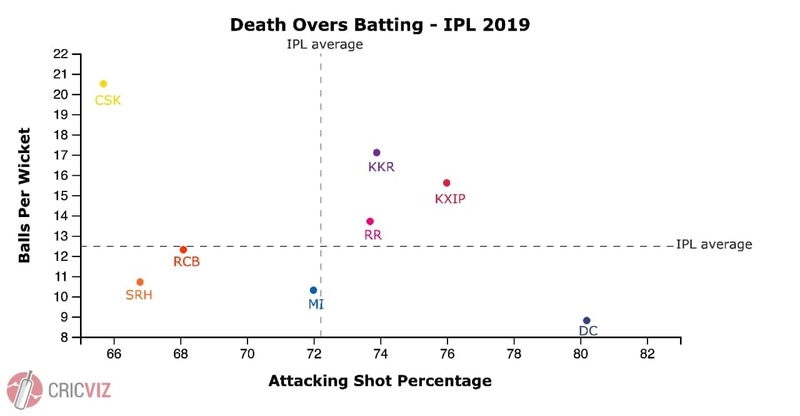 Delhi’s propensity to collapse in the latter half of the innings is a consequence of their exceptionally high attacking shot percentage in the phase of 80% - comfortably the highest of any team. Attacking in the death overs is obviously important but DC may need to add a touch of responsibility to their play in the latter stages if they are to avoid similar mishaps. Delhi have historically struggled to establish a home advantage at the Feroz Shah Kotla - they have only won 42% of matches at the venue with the pitches proving notoriously unpredictable. This season - despite a clear spin-heavy bowling attack and Indian-heavy batting order DC have struggled on the slow, low pitches at the Kotla, losing two of their three home matches with their only win coming in a Super Over. After their defeat against SRH, head coach Ricky Ponting expressed his disappointment at the pitch which he had been told would be the best batting track of the season but saw a low-scoring match. KKR have been one of the strongest teams so far this season with four wins from five matches placing them top of the league table. However, their potency with the ball has been a concern - no team has a higher strike rate than their 33.2 balls per wicket.